The Amazon rainforest is disappearing right before our eyes. In the past 20 years alone, an area the size of two Germanys has been clear cut from this ancient tropical rainforest and this is hardly the full extent of the damage. As the Amazon loses trees, it is also losing its ability to regulate weather patterns which is causing massive droughts in São Paulo, Brazil. To make matters worse, all of the animals native to the Amazon are being put in grave danger as their home is destroyed right in front of them. Pushed to its limits, this ancient rainforest is crumbling at the hands of humans – leaving us to wonder, what is driving this destruction? To find that answer, you might not have to look much further than your very own plate. 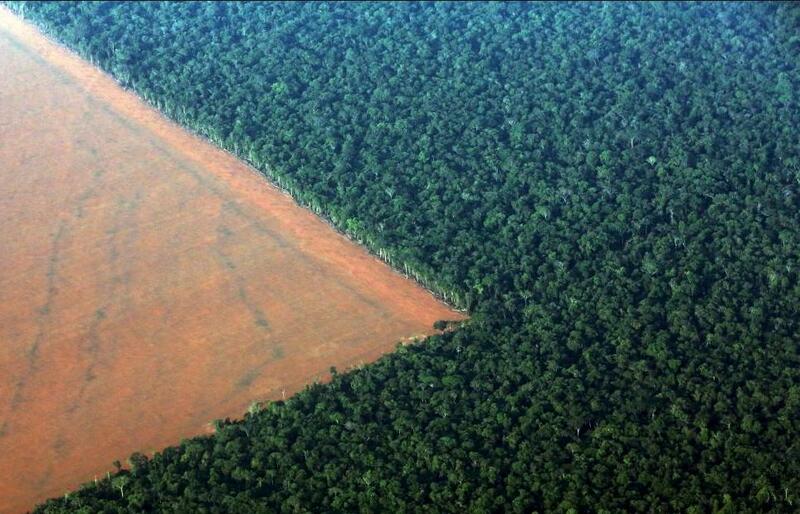 In the Amazon, deforestation is largely driven by agriculture. Specifically, in the Brazilian region of the Amazon, around 80 percent of deforestation is caused by cattle ranching and this rate increased by 29 percent in the past year alone. Deforestation related to soy production for livestock feed in Brazil is responsible for 29 percent of the country’s greenhouse gas emissions. Around 70 percent of the world’s soy is fed directly to livestock and only six percent of soy is turned into human food, which is mostly consumed in Asia. The land you see here has all been leveled to feed cows, pigs, and chickens across the world. As the world’s population increases and demand for meat and other animal products rises, this destruction is only set to increase. Researchers from the University of Cambridge found that given current deforestation rates, between one to two major species groups are wiped out for every 10 percent of forest cover that is cleared. So, the next time you take a bite of a burger, imagine the massive bite that producing that beef took out of the Amazon rainforest. Sadly, the impact that our appetite for meat and dairy has on the planet extends far beyond what is happening in the Amazon. One Green Planet believes that our global food system dominated by industrial animal agriculture is at the heart of our environmental crisis. My 7 yo daughter asked if the Tropical Rainforest is real (studying in 2nd grade I guess?). I said yes but it will disappear. Then I brought this article up to read to her. She was upset saying we need the forest for food and the air we breathe. As I am eating my brussel sprouts and she is eating chicken wings her father gave her, she asked if chicken is a meat that needs soy, "YES!". She drops the wing and walks away from the table…..Lesson learned. Maybe she will consider veggies for her lunch tomorrow!